Behind Herndon’s past as a sleepy farming community hide forgotten tales of growth and progress. A mysterious stranger who passed through the village one night suggested the name Herndon, after the captain of a sunken ship. The Civil War split loyalties among the townspeople and brought an unexpected Confederate raid on the town. Prohibition brought bootleggers with it, but its repeal caused an uproar from temperance-minded residents. Lively community fairs were ever present in the 1920s, but so was the Ku Klux Klan. 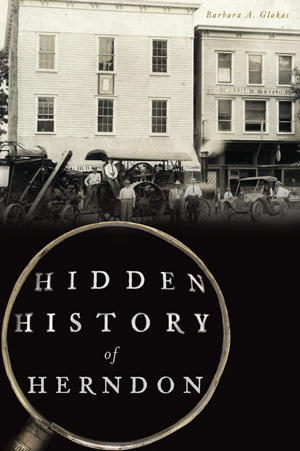 Local author Barbara Glakas uses rare photographs and firsthand accounts to tell little-known stories of the people, places and events that shaped the history of the Town of Herndon. Barbara Glakas currently serves as the historian of the Herndon Historical Society. She has spent several years researching, writing stories and making videos about the history of the town of Herndon, Virginia. Barbara and is a native of Fairfax County, Virginia. She is a graduate of James Madison University and is a retired teacher from Fairfax County Public Schools. Barbara currently lives in the town of Herndon.